The Panorama Wellness area on the roof lounge is reserved for adults and features the "Stille Alm" relaxation room with rustic flair and a fantastic view of the surrounding mountains in Valles all the way to the Dolomites. The special treat: The relaxing wave motion of the waterbeds helps the whole body to unwind. The "Masl Acqua" Pool Wellness area also features comfy loungers and special relaxation elements. 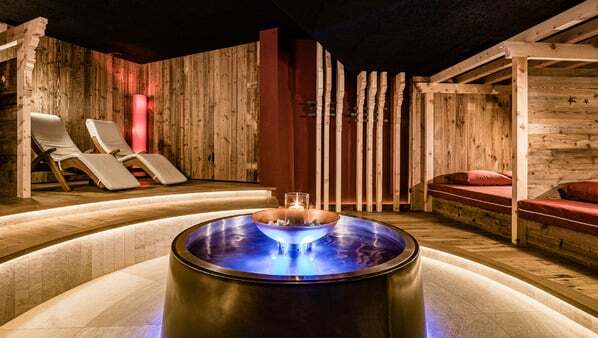 In a separate area to the swimming and sauna area, the special relaxation room is bathed in light and features a fireplace and direct access to the wellness park with sunbathing lawn. Total relaxation: the inviting relaxation rooms at the Wellness Hotel Masl make sure of this.